As La La Lamazing Grace. (c) Trisha Jeffrey. Click picture to see full size! Trisha played "La La Lamazing Grace" in the show The Colored Museum by George C. Wolfe at Harlem School of the Arts, directed by Alfred Preisser. The show is a satirical look at what it means to be black in modern America. Trisha said, "people study different celebs for this but mine was Josephine Baker," the sensual actress, dancer, and singer from the Harlem Renaissance era who also served in the French Red Cross in WWII and supported the civil rights movement by refusing to perform in venues without an integrated audience. Trisha choreographed this first show of the Classical Theatre of Harlem, directed by Alfred Preisser. It was a great success and was, according to CTH's press statement, "the first professional production of Macbeth in Harlem since the historic 1936 production directed by Orson Welles." Click here to see more information about the 1936 Welles production that rocked the Great Depression! 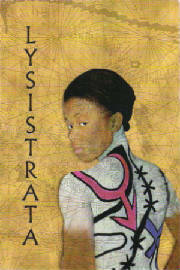 Lysistrata cover. Click to see in larger size. Under the direction of Alfred Preisser, The Classical Theatre of Harlem performed Aristophanes's Lysistrata, showing a unique way that women unite to stop war. Again, this was a successful and landmark show - it was the first time the show had been produced in Harlem in over 50 years. Lysistrata showcased both Trisha's choreography and acting talents. Her "Afro-Carribean" dances used traditional African Fertility Dances and South African Boot Dances. She was a member of the chorus in the role of "Ismenia" and the literal representation of "Peace," as well as featured on the cover art (left). Go here for an article from The Village Voice about the show!